To help rebuild trust in business, finance teams should utilize new technology to manage data, and adopt new skills to report their long-term value. Organizations have an urgent need to develop the reporting transparency that helps builds trust and helps explain how they are creating long-term value. To do that, they should exploit the data at their disposal and turn it into a strategic asset. However, many organizations are failing to seize these opportunities. They are failing to capture information and thereby failing to exploit all of their financial and non financial data. They are simply overwhelmed by the variety and volume. To take control of this data flow and transform it from a liability into an asset, organizations should rethink their approach to a range of technologies, including AI, build a different talent profile and boost the skill sets of their existing workforce. By addressing the three actions above, finance leaders should be able to move beyond reporting just what is easy to measure, to providing the insight capital market stakeholders need in order to understand the drivers of long-term value. By providing this transparency, finance leaders can help to restore trust in business and public institutions. These insights into how reporting should change are drawn from findings from the 2018 EY Global Financial Accounting and Advisory Services (FAAS) corporate reporting survey. You can also explore the data behind the survey, view country results and compare findings across countries and industries. Companies and capital markets depend on trusted and relevant corporate reporting. It underpins companies’ reputations and builds market confidence in the actions of company leaders. Now, however, the effectiveness of corporate reporting is threatened on two fronts. The first is the widening trust gap between business and society. This EY research found that only 58% of finance leaders are prepared to say that businesses are highly trusted. It might be expected that corporate finance leaders would be relatively positive about trust in business, but a lukewarm response is a common pattern across many regions. For example only 55% of respondents in EMEIA are prepared to say that businesses enjoy either “very high trust” (12%) or “high trust” (43%). The public’s weak trust levels in business are reinforced by the disconnect between the reporting agenda of corporates and the public’s agenda. Often, reporting fails to capture nonfinancial information as a driver of organizational performance. Therefore, organizations should account for and explain performance much more clearly and coherently. The research shows that finance leaders now expect reporting on a bigger picture. Just under three-quarters (72%) of finance leaders say that nonfinancial information is increasingly used in investors’ decision-making, and over three-quarters of group CFOs emphasize its importance. However, despite this significant progress, more should be done to challenge reporting. There is a tendency to report the wrong things – measuring what is easy rather than what stakeholders want to know. This is particularly true of intangible or nonfinancial assets. Close to three-quarters of finance leaders – 73% - say “our performance on nonfinancial KPIs has a significant impact on intangible assets.” This is a sentiment shared across the finance function with 75% of group CFOs and 70% of group financial controllers agreeing. The long-term value approach demands new frameworks that communicate the value of strategic assets, provide information that multiple stakeholders demand, and show how organizations are creating value over the long term. The Embankment Project for Inclusive Capitalism is a step toward this kind of framework. As businesses respond to calls to demonstrate their contribution to inclusive long-term value creation that benefits all of society, the Coalition for Inclusive Capitalism and EY have brought together CEOs from more than 30 leading organizations, representing more than US$30t of assets under management, to work on a way to more effectively articulate how they create value for stakeholders and reduce the pressure to make short-term trade-offs. The initiative called The Embankment Project for Inclusive Capitalism, is developing a measureable, comparable and meaningful way for companies to better articulate how they create long-term value for their stakeholders. The project involves corporations from across the consumer products, health services and the industrials sectors, in addition to investment and asset management organizations. Over the course of the project, participants are working to identify a set of outcome metrics and developing a framework that helps companies articulate how their strategy will deliver long-term value. The increasing focus on nonfinancial information means that stakeholders will challenge reporting more. Management and boards should be convinced that the information is useful and relevant; regulators will want to know that it is accurate and compliant. If all reporting information – whether it is financial or nonfinancial – is not investment-grade, trust will suffer. Independent assurance of information, either mandated or voluntary, can play a critical role. EY research finds that companies that have their nonfinancial information independently verified are more likely to be confident that their corporate reporting is trusted. Overall, 62% of respondents say that corporate reporting enjoys high levels of investor trust, but this increases to 83% among those who have their nonfinancial information audited. The EY Climate Change and Sustainability Services (CCaSS) research show that much of the impetus for improved and better integrated reporting is coming from the institutional investor community. Global policy debates, new regulatory requirements and more stringent supply chain practices play a part, but the collective voice of the investor continues to be among the clearest. In EY's Climate Change and Sustainability Services research, for instance, most (96%) of investors said that nonfinancial performance had played a pivotal role “frequently” or “occasionally” in their investment decisions in the past 12 months. Organizations and their finance teams have more data than ever before thanks to increases in computer processing power, ever-growing connectivity, and the cloud and its massive storage capacity. They are advanced in using robotic process automation (RPA) to drive new levels of efficiency. And they are using rules-based robotics technologies to automate high-volume transactional finance processes. They are already exploring the next frontier in automation – intelligent process automation, which combines RPA with AI such as machine learning. These technologies learn over time as they are exposed to more data, allowing finance teams to target high-value finance responsibilities. As these tools improve, they will move on to reading, managing and analyzing complex contracts and data. Other intelligent technologies that could work here include speech recognition, natural language processing, biometrics and chatbots. Finance leaders can use AI to look for underlying patterns in data as well as machine learning to predict scenarios and improve outcomes. Close to three-quarters of finance leaders in this research (72%) say that AI will have a significant impact on the way finance drives data-driven insight, and that AI will be the critical technology for the finance function in the future. Finance leaders were asked to rank the importance of three technologies – RPA, AI and blockchain-based tools. Although RPA came out on top for now, AI leads the list in five years’ time. However, finance leaders do not just have to think about how they use AI in their finance functions. They should also think about how stakeholders, such as investors, are using it to highlight corporate reporting. This is because AI allows investors to analyze corporate financial information in ways that were previously unthinkable. AI is developing rapidly, and it is critical that finance leaders keep up. This means making informed decisions now about where the technology can drive most value in finance and reporting. Only then can finance leaders plot out their transformation and lay the groundwork for strong collaboration between finance and IT. But there are ethical issues. In finance and reporting, it is not enough to ask whether systems are doing things right. You should also ask whether systems are doing the right things. This is especially important with a fast-moving technology such as AI, because rules and regulations lag behind technology, and have not yet been proven to assure and address risks adequately. One approach to developing ethical standards for these tools is to ask the stakeholders who will be impacted by the technology to look at it from their perspective. And the design of the system should reflect the importance of transparency around how the reporting system has made its decisions. Blockchain: disrupting the future of reporting as we know it? Blockchain records transactions using a distributed ledger, which gives every network participant a secure audit trail of all transactions ever made – in near real-time. Some commentators, therefore, expect the technology to become the industry standard for reporting and accounting, replacing existing back-end IT and traditional reporting practices. If blockchain is used to automatically consolidate accounting records automatically, then reporting teams can spend less time on cross-checking and aggregation, and more time on analyzing data that can be trusted. This research shows that a number of finance leaders agree on the technology’s potential. Our research shows that close to one-quarter (24%) say that blockchain will be finance’s most important technology in five years’ time. Of course, a number of challenges will need to be overcome. For example, key stakeholders – from regulators to boards – would need to agree on and implement the required regulatory environment. 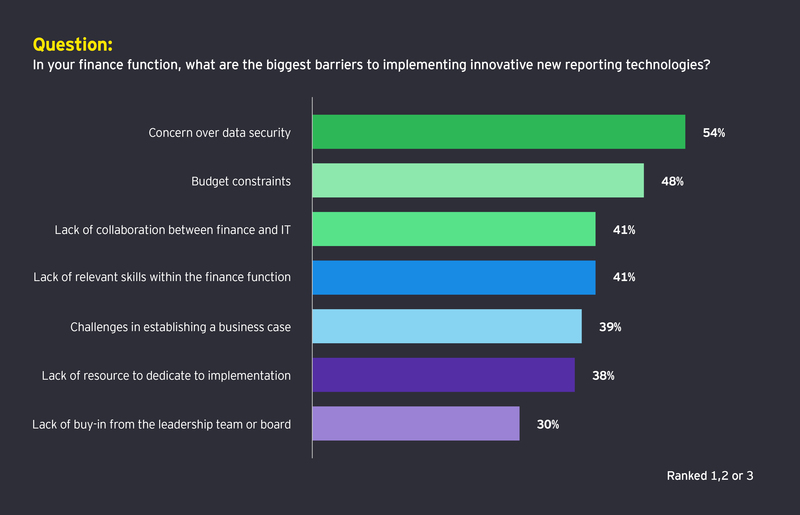 Finance leaders are focusing on turning data into reporting insight, but they have to negotiate a difficult balancing act; driving innovation in how they use data without compromising standards and undermining trust. This research shows that concerns about data risk are at the top of finance leaders’ minds. And concerns about data security are one of the most critical barriers to implementing new reporting technologies. However, concerns about digital and data risks should not hold organizations back. To get to true value-driven reporting finance teams should be able to embrace their data with confidence. This will require changes not only to technology and processes, but also to mindset, skills and governance. Value-driven reporting does not just demand that finance teams adopt new technology – they also require a different talent profile and skill sets. The finance function will benefit from team members with a range of new capabilities beyond traditional finance and accounting skills, including strategic awareness of new technologies, such as AI, and knowledge in disciplines such as data science and advanced statistics. Those who can help the team understand and measure the interdependencies between nonfinancial and financial information will prove valuable. That skill requires a grasp the nuances of nonfinancial information management and understand the interdependencies among the organization’s different types of capital. Finance leaders know the function’s talent profile needs rebooting. A significant majority (79%) of the CFO respondents to this research say that there is an urgent need for finance to recruit new skills. However, driving a change in approach can be very difficult, with an entrenched culture and resistance to change acting as a brake on progress. 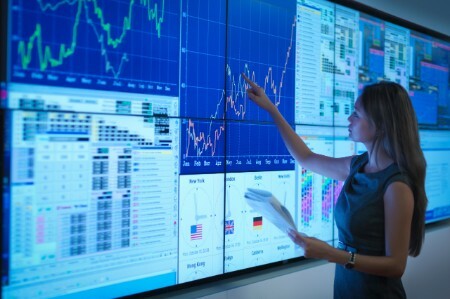 In this research, 63% of finance leaders say that “resistance and cultural barriers within finance teams are barriers to digital innovation.” In technology companies – which have to constantly drive innovation to survive in an industry where the technology agenda is constantly changing – senior finance leaders are particularly concerned about their teams’ ability to embrace digital ways of working with the speed that the organization as a whole demands. To overcome resistance and accelerate the changes that should happen in the finance workforce, organizations should focus on two priorities. Finance is starting to require people with new skills. The next generation should understand not just accounting and their industries, but also AI, blockchain and machine learning – as well as how these technologies work together. In this research, 72% of all finance leader respondents say that AI experts will be critical to driving innovation in finance and reporting over the next two years and this is a priority across all areas. Finance leaders should define the skills and capabilities they will require on the basis of their companies’ strategy as well as the need to maintain or increase transparency and build long-term value. Leading finance functions are auditing the existing capabilities of their teams to understand what gaps they face. This should include both hard skills required to exploit new technologies and data as well as soft interpersonal and strategic skills. Many organizations understand that they require new skills and profiles, but they often fail to look for talent in different places, and do not use new tactics for developing their people. Too often, they are stuck in traditional practices: they use the same methods that have been in place for years, and were used to recruit and develop themselves. Finance should do more to challenge these entrenched approaches and views of what constitute finance capabilities. The automotive industry, for instance, has responded boldly to the challenge of digital disruption and connected cars. Finance leaders in this research recognize that they should be creative about how they source and develop people: 76% say that finance should widen its recruitment net to find people with nontraditional backgrounds. 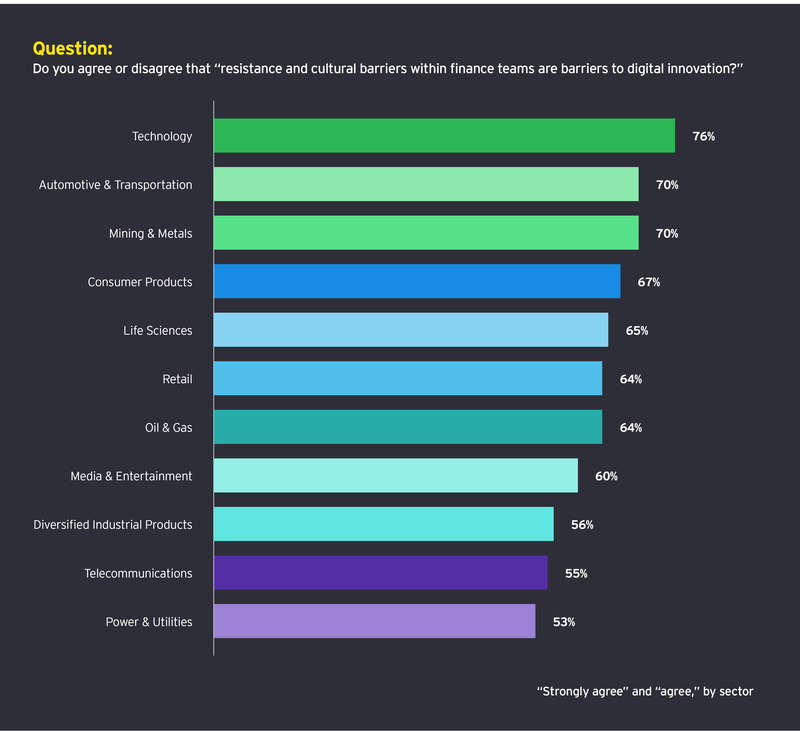 This EY research shows that while all respondents believe new areas of technology expertise will be critical to driving digital innovation, younger finance executives place more of a premium on this area. For example, for finance executives who are 39 or younger, over a quarter (27%) say roboticists will be “very important” to digital innovation in finance. For those who are 50 or older, this drops to 16%. 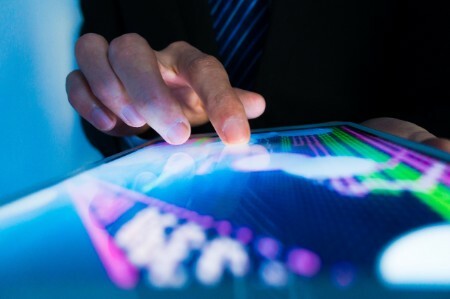 It was found that younger finance executives are also more likely to feel that data scientists and statisticians will be very important when it comes to driving digital innovation. This perhaps reflects the fact that younger generations are very much aware of the impact of new technologies, and are more open to finance recruiting the expertise required to respond. Trust can take a lifetime to build and seconds to lose. While rebuilding it depends on many factors, reporting can play a vital role. Reporting teams should be able to exploit the rich, multidimensional data they now have access to. Using digital technology and analytics skills, you may provide the reporting insights that give stakeholders visibility into the business and support long-term value. You should compare your approach to reporting against peers and leaders in this field. This can help stimulate your thinking about creating a structured framework for reporting long-term value to key stakeholders. You also should consider how they approach nonfinancial assurance so that external stakeholders and boards trust that information. You should also consider how to manage risk and seize opportunities to improve supporting processes and systems. 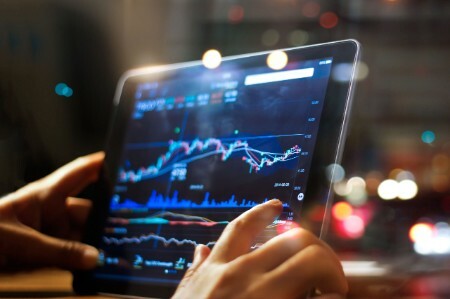 Over the coming years, intelligent systems are likely to play an increasing role in more reporting processes and tasks, transforming the ability of finance teams to drive insight from their data. 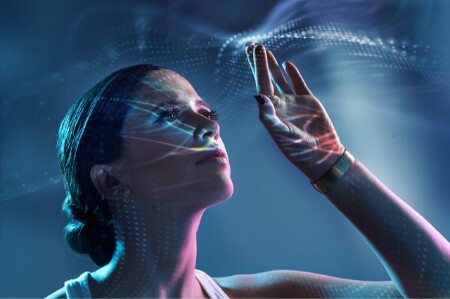 To realize the potential of intelligent systems, you should act now to identify the reporting issues these technologies may solve and to set out how they could transform your approach. This can give finance both a compelling vision and a practical road map for change. This may also help you overcome organizational resistance and engage with key stakeholders such as supervisory boards and audit committees. There is an important balance to strike between “data as a risk” and “data as an opportunity.” You should drive data innovation while avoiding lapses in data security and threats to your customers’ privacy. This means creating the right internal culture for data, with everyone following a clear data strategy underpinned by a code of conduct and data governance framework. And rather than seeing regulatory frameworks for data protection and privacy just as compliance exercises, you should consider reframing them as an opportunity to take a positive approach to data. Organizations have an urgent need to develop reporting transparency in a way that builds trust and helps explain how they are creating long-term value by exploiting the data at their disposal and turning it into a strategic asset. In order to help rebuild trust, organizations should utilize new technology to organize and analyze data and adopt new competencies beyond traditional accounting skills to deliver value-driven reporting.